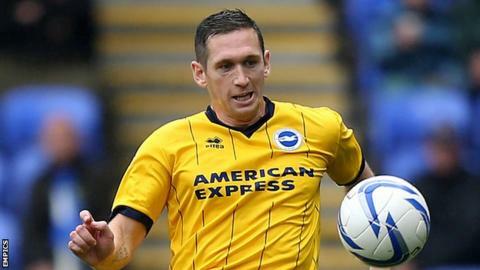 Brighton & Hove Albion midfielder Andrew Crofts says the team's results and performances are more important than his own goalscoring form. The 29-year-old became their top scorer by hitting his fifth goal of the campaign in the 1-0 win over Wigan. "Goals are a bonus as there are other parts of my game I like to do. "The important thing is to keep climbing the table and working hard. That is what the boys are doing," the Wales international told BBC Sussex. "I've always worked hard to get up and down the pitch and get in good areas. If you keep doing that the ball is going to fall to you." Brighton's victory at Wigan was their third in a row and lifted them to ninth in the Championship table, two points outside the play-off places. It was also Wigan's first defeat at the DW Stadium in all competitions this season. "To come and be the first team to beat Wigan is massive. The gaffer [Oscar Garcia] spoke about it before the game and for us to do it is brilliant," said Crofts. "We showed character and the whole team effort was brilliant. There is a good vibe about the club and everyone is pulling in the right direction." He withdrew from the Wales squad to face Finland earlier this month, citing a groin problem, but insists it is not a major issue. The former Gillingham trainee has been a key player for the Seagulls this season, making 15 appearances in the league. He added: "I'm trying to keep on top of stuff and look after myself. You get a few niggles here and there as being a midfielder you cover a lot of ground. "Chris Coleman [Wales manager] was great about it. I want to go away again with the national team and I hope I will. "At that stage it was important for me to rest up and get some niggles sorted out."